The tightening of wrenches and spinning of tires was a departure from the normal work Hudson Garbage employees do, but last Friday night, Dec. 14, Hudson employees, along with several other volunteers in Columbia County, spent their evening at the Columbia City Community Hall, assembling 139 bicycles for children. The build-a-bike event has become an annual affair, organized by Hudson with volunteer help from the company's employees, along with assistance from elected officials and other county residents. The bikes will become holiday gifts to children served by the Department of Human Services and Rainier's Gift of Giving Tree. "They delivered 77 bikes for kids, which is incredible," said Julie Nix, a program manager with DHS Children's Services in St. Helens. "We had sort of an assembly line of bikes going into the conference room. It's amazing how many smiles it brought just to our staff, so you can imagine what it will be like for the kids when they get these bikes." Herb Bailey, district manager for Hudson, says the company started the charitable event a few years ago to benefit less fortunate children during the holidays. "I think the motivation in general is just about giving to our community," Bailey said. "This is what makes Columbia County, Columbia County." 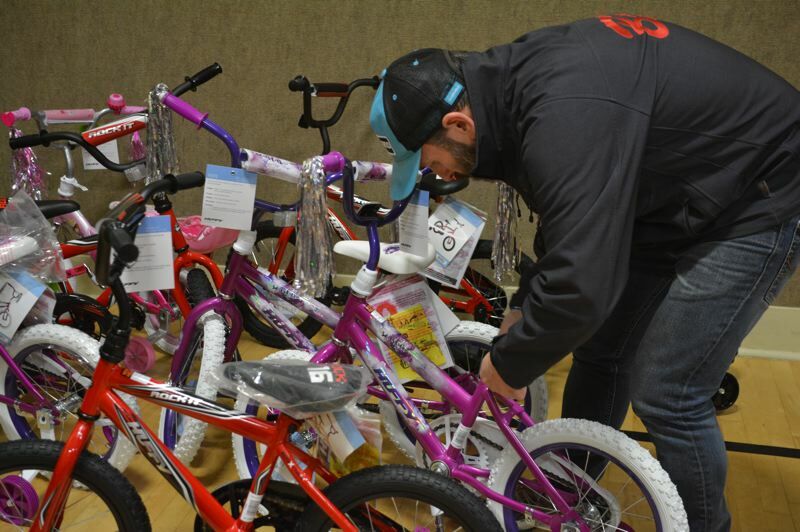 In all, 139 bicycles were assembled for delivery to children across the county. Walmart in St. Helens provided the bikes at a heavy discount, Bailey said, and pizza for volunteers at the event was discounted by Fultano's Pizza. "This year, we just had a lot of collaboration," Bailey noted. "A lot of people stepped up. Local businesses helped out, our drivers donated time and their own money. Our office staff stepped up." The bikes, ranging from neutral, utilitarian gray mountain bikes, to training bikes with bright pink streamers, were lined up in rows around the community hall. Volunteers shuffled around the room, moving tools and lifting bike frames as Christmas music blared in the background. 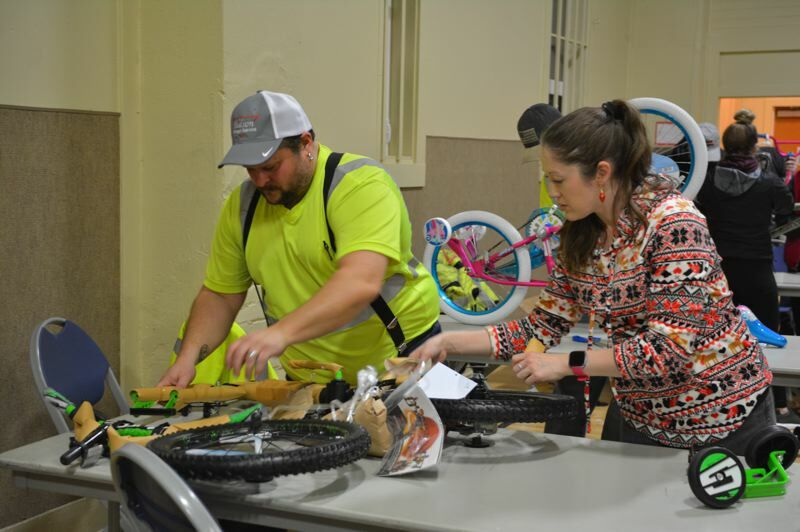 In the center of the room, Columbia County Roads Department assistant director Tristan Wood and Hudson employee Kendelle King collaborated on a mid-size bike build. To the front of the room, County Commissioner Alex Tardif stayed focused on finishing a child's bike. As each bike was assembled, it was moved to a staging area in the back of the hall, where Paul and Jordan Barlow of Barlow Bikes did final inspections. St. Helens Mayor Rick Scholl and City Councilor Ginny Carlson stood close by, moving bikes out of the area as they were cleared by the Barlow team. Bailey says the hard work of volunteers paid off earlier this week, as the last round of bikes was delivered to the DHS offices. "They were so appreciative," Bailey noted. "They were clapping and a couple of our office folks, you know, you get a little choked up. It's nice." The bikes will reach the kids just in time for Christmas.